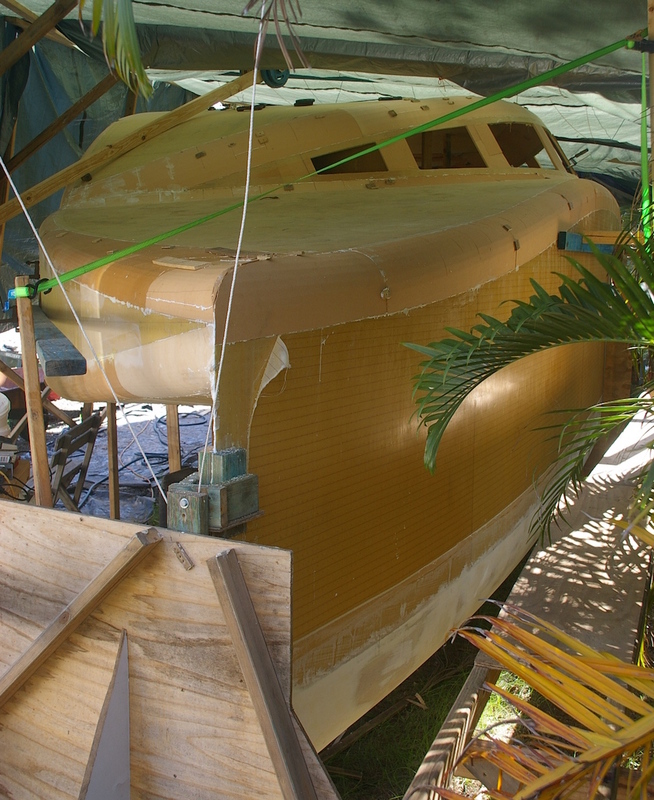 Since the blog was last updated I’ve managed to complete the structure of the windward hull. 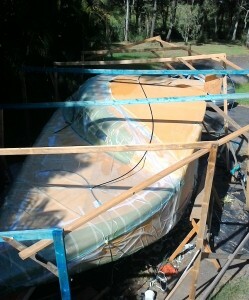 Fit out, a minor amount of fairing and a couple of radius infusion touch ups remain. With virtually all the flat panels and bulkheads infused, it was time to assemble the parts. In the main, the assembly was straight forward. 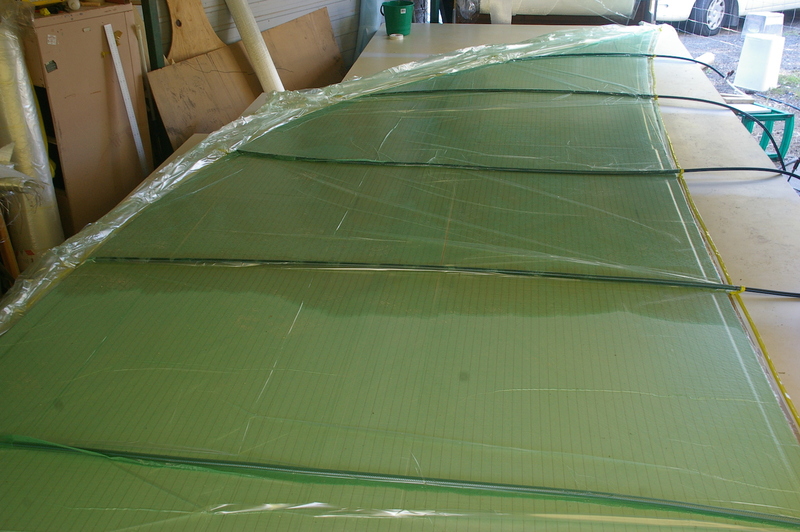 But, as I had anticipated, the more triangular flat panels were more difficult to bend uniformly. Temporary frames, ratchet straps and weights proved invaluable. The cabin roof was the last piece infused. 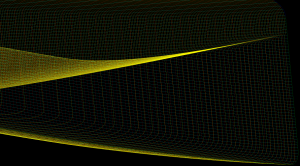 Given the amount of curvature, I wanted to infuse the panel and bend it green. Once the flat panels were in situ, the gaps were sealed with kerf sawn foam. The process was relatively straight forward, if time consuming. 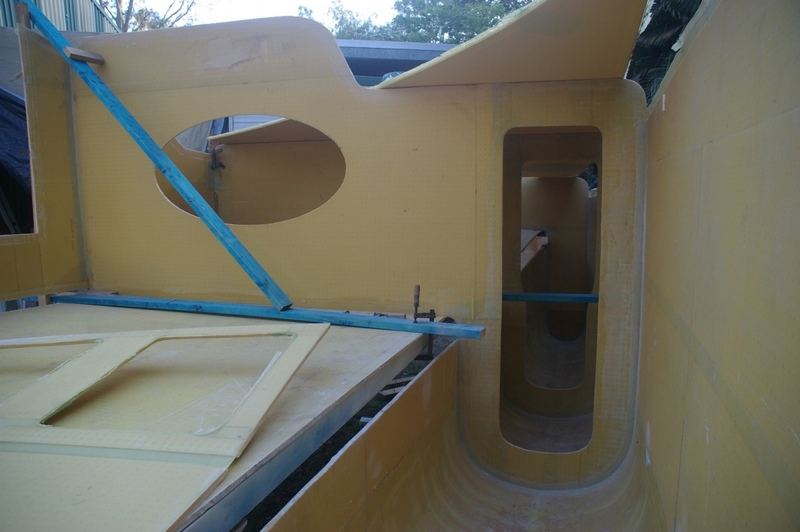 Once the foam fitting was completed, the radius curved areas were infused inside and out at the same time. A very complex setup, but one that required no foam sealing – and the infusion void filled at the same time. I’m planning on using this technique on the lee hull bilge and deck. 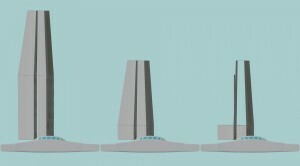 I’m relieved however that the complex shapes are now finished. I must admit I’m impressed by the simple mould technique that has been developed for Bucket List and subsequent designs. 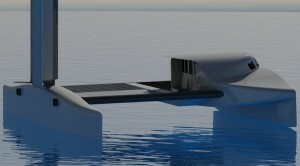 It is a little too late for me to adapt this technique for the lee hull as the styling would be too starkly different. Anyway, the kerf bending has proved to be effective, and I’m becoming more proficient with the technique. It’ll be interesting to see how many hours will be required to complete the lee hull. The windward one took longer than I’d hoped. But then again perhaps 15 months part time, a newbie using a new technique (plenty of trial and error) is ok.
More pictures added to Windward Hull Gallery. 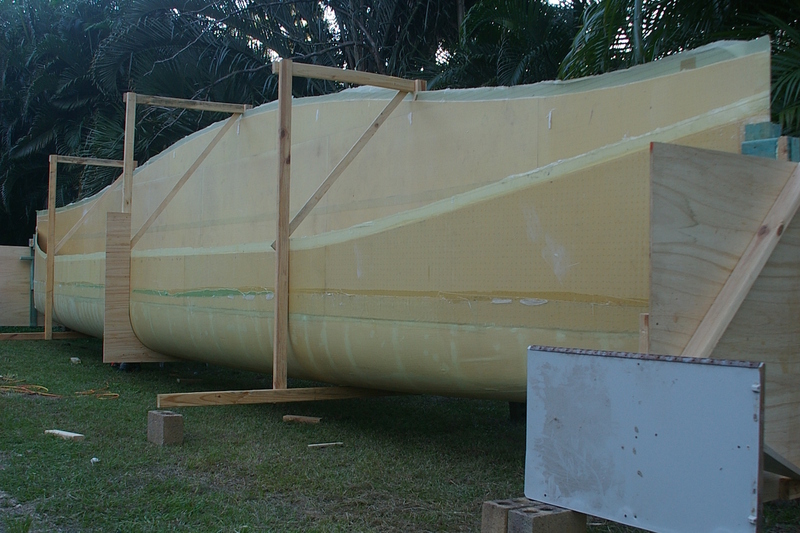 Since the last update, the windward hull bilge has been infused outside then in. Whereas both sides of the topsides were infused in one hit, the bilge was infused one side at a time. 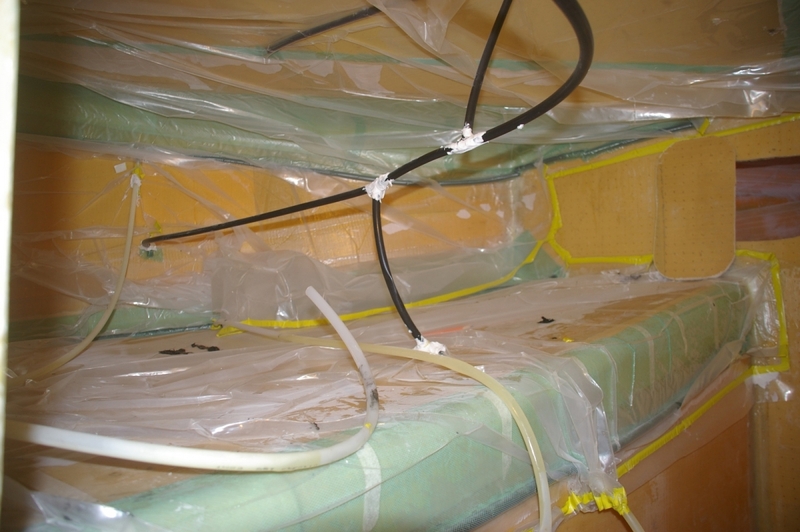 Infusing the outside was straight forward once the through foam leaks had been identified. 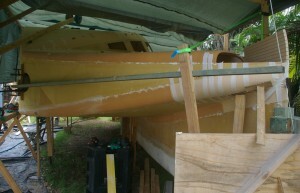 Pivot blocks were attached to both bows and counter weights attached to the temporary bulkheads, enabling the hull to be easily turned by one person. Three external frames permitted the removal of the internal frames. At this stage, the hull was relocated to the yard where fairing and assembly will occur. 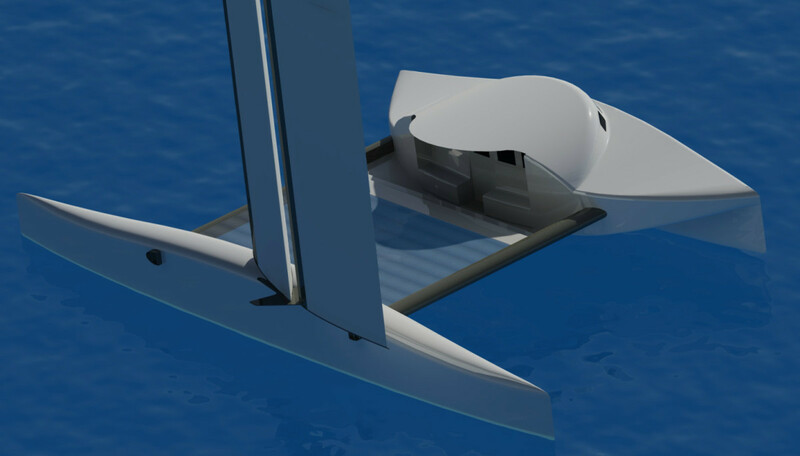 With the hull still mounted on the pivot mechanism, bilge fairing (minimal) will be completed, with the hull upside down, prior to assembling the decks and cabin. The cabin floor and decks have been infused, with the cabin sides and cockpit seating infusion ready to plumb and bag. The remaining bulkhead foam frames are cut and ready for the next infusion. 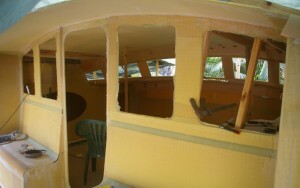 All being well, assembly of the infused panels will commence during July. 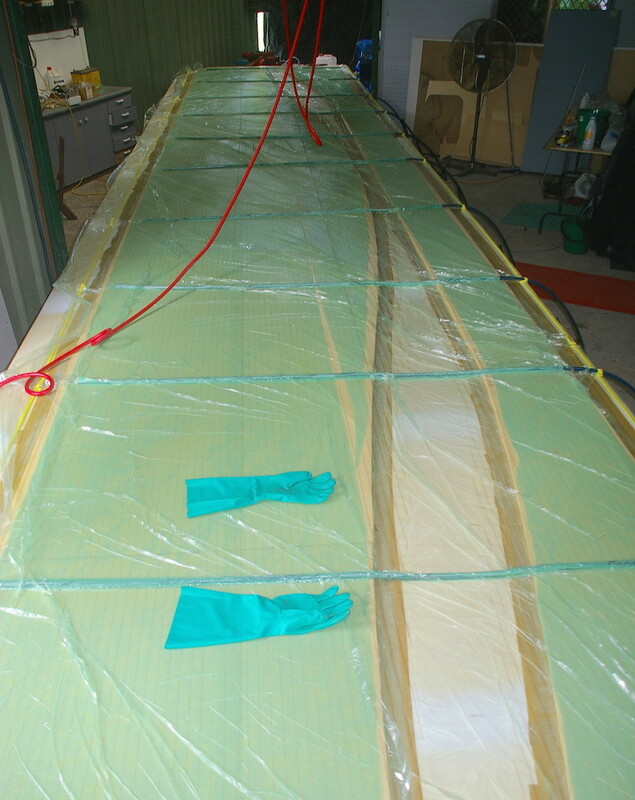 Infusion of the remaining part for the windward hull, the cabin roof, will be delayed until it is required. I am considering putting a pop top section in, the aim being to increase ventilation and visibility when desired. Note the rebates that surround the cabin floor and deck flat panels. The rebates are on both faces. 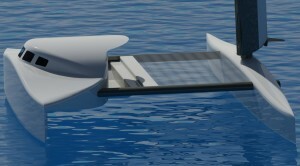 This will enable foam core glass overlap joins between the panels with minimal filling and virtually no fairing. All joins between panels are radiused. These radii vary between joins and, in some cases, along the join: the principal reason why I haven’t used the deck edge radius idea (some radii are in fact far too large anyway). 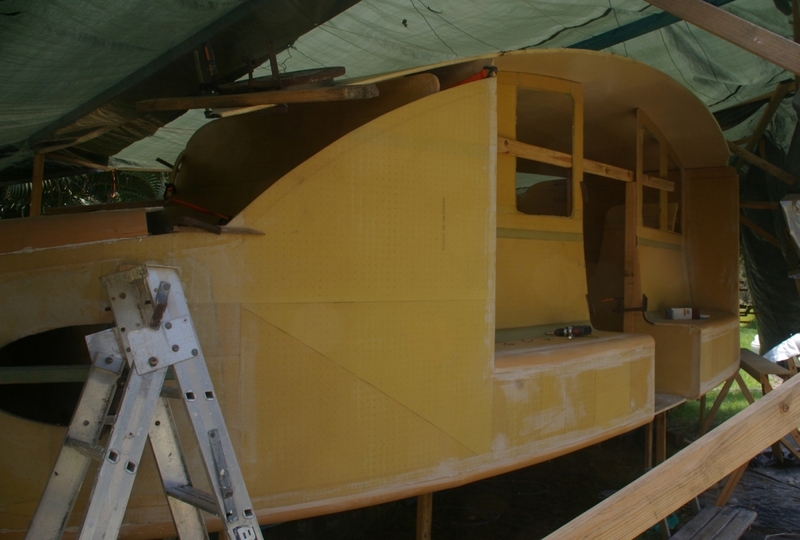 The flat panels will be bent to shape and held in situ with temporary framing; prior to fitting kerf cut foam in the radius join area between the panels. 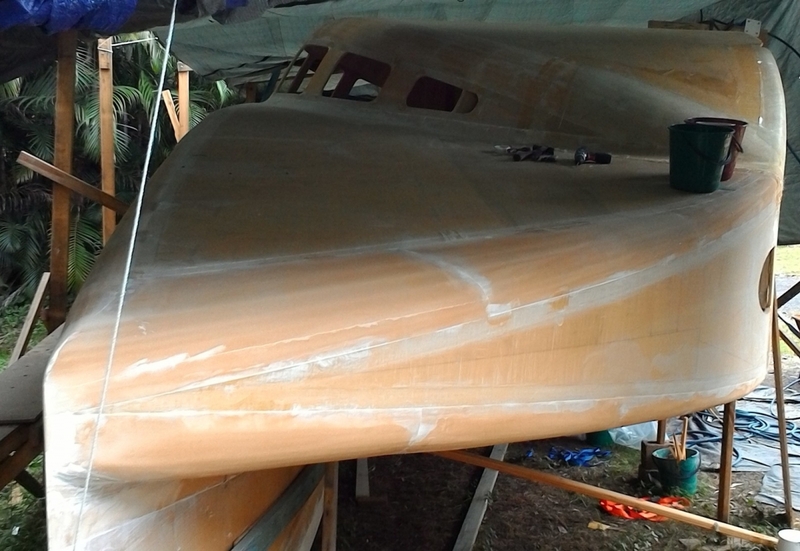 After trialling infusion on a couple of bulkheads, the windward topsides were infused. 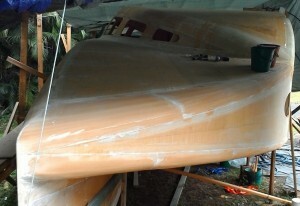 Topside bows were chamfered 55mm on the inside and rebated on the outside. Bonding the chamfered topsides together was straightforward and the rebating was successful. As discussed in the design section, I decided not to use an edge radius due to the large and varying radii in this design. Instead, I planned to rebate panels and use grooved foam to form the radii. To this end, rebate formers were taped to the table. Unfortunately, I decided not to place foam over the rebate at this stage, thinking the rebate edge would help to align foam that was to be edge glued later. First mistake. 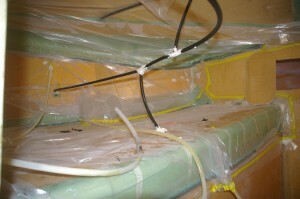 The vacuum bag wasn’t tapped evenly to the table – notice the diagonal pulling of the bag. My son was pleating one side and I, the other. I didn’t notice until too late that his pleats were shorter than mine (my fault). In a couple of locations (notably at the plumbing) a diagonal pleat formed over the glass, permitting the glass to float up in the infusion. 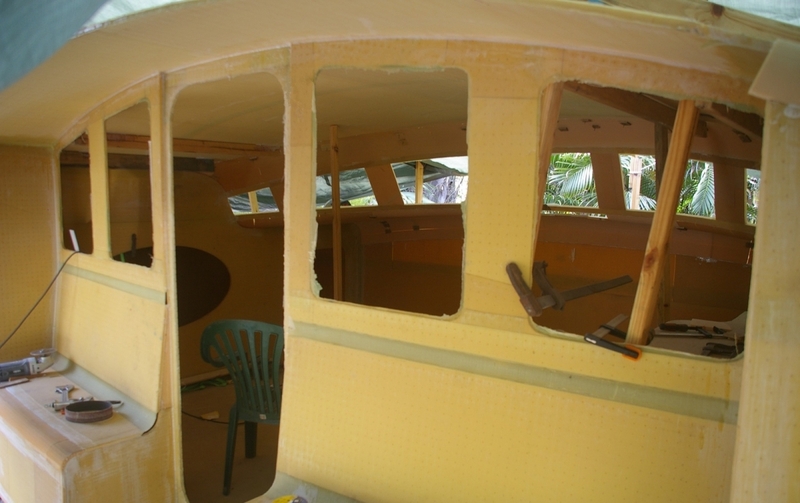 In future the rebate area will be foam and glass on both sides. Remove a small amount of foam to provide an alignment pocket for foam to be edge glued later. 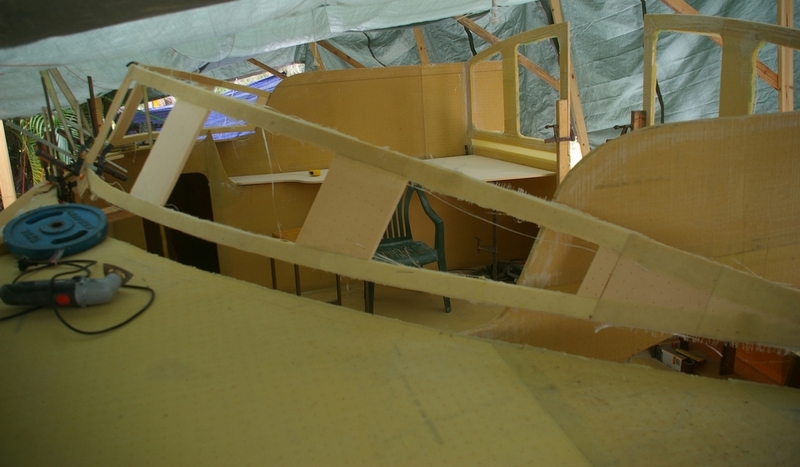 Due the sharp turn of the bilge (this turn being a quadratic Bezier curve rather than an arc) from vertical topsides to a fairly flat bottom, I decide not to glass the underwater sections prior to bending the foam. This meant that only the tighter bends in the bow region required internal grooving. The entire bilge area will be glassed (the plan is to infuse) in two hits – outside then inside. 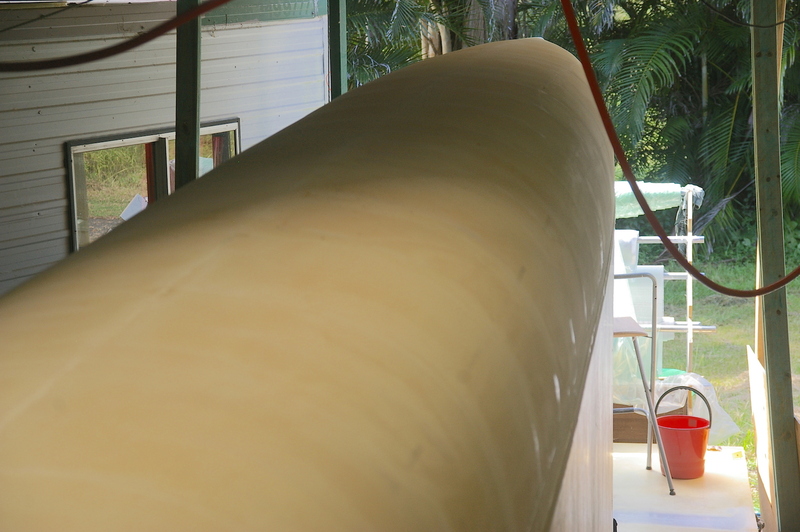 I did some bending tests and grooved the foam within one metre of the bow. Bent the foam up – shape looked good – then bang! The foam cracked just beyond the end of a groove, propagating all the way to the midsection. Damn! I glued the foam back together, grooved the foam a bit more, and increased the depth of the dart cuts in order to stop a crack propagating. Making the dart cuts deeper was the bigger mistake. The dart cuts can be smaller than for a glassed panel due to the compressibility of the foam – and the shape is fairer when this is done. I mostly glued the dart cuts back together. The end result is a shape that I’m happy with. The procedure shows promise, but I’ll reserve judgement till the second hull is built. 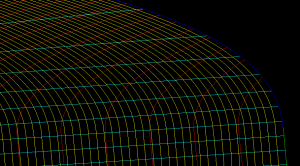 At least the software worked well – the compound curved panel shapes were correct. 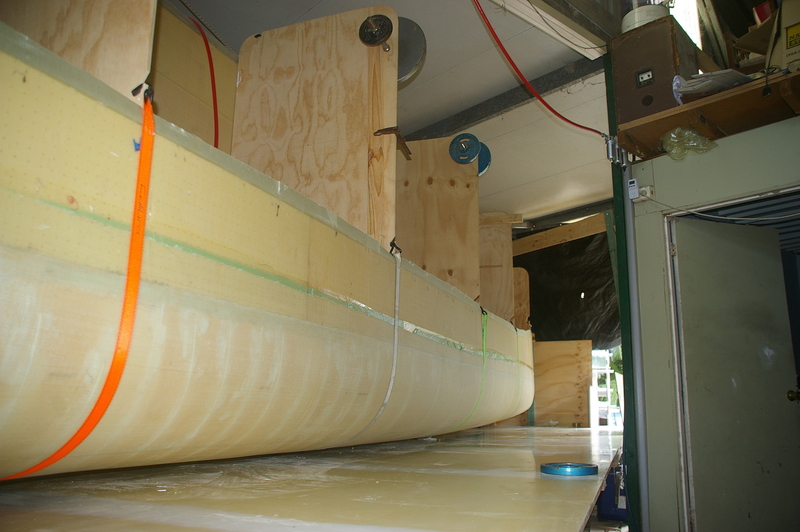 Bonding the foam at the keel required an internal keel batten. The foam was screwed down to the keel batten and the chamfered foam edges epoxy bogged. 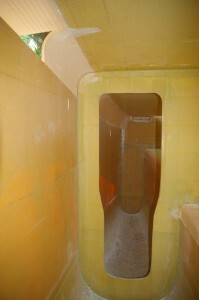 Copper stiches and screws (from inside the hull) were used In order to stop the foam bulging up from the keel batten. In both cases the copper and screws had to bed into epoxy bog as foam alone would of course tear. A final note relates to my epoxy allergy. Having suffered from hay fever and asthma for most of my life I was statistically more likely to suffer. Consequently, for large jobs I wear a chemical suit, gumboots and a compressor power air hood. Being a diabolical combination in this climate, I also wear an ice vest and pump air through the suit. You can begin to understand why I don’t want to hand laminate – infusion is a joy, even with these constraints. Fortunately I don’t seem to be as sensitive to West resin – perhaps due to less vapour exposure. 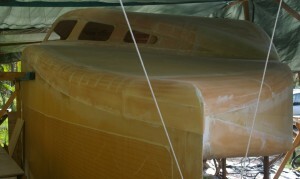 When using this material for bogging and fairing, I need only fully cover myself head to toe. Notably including, welding shroud (completely covers my sensitive forehead) , respirator and full visor. David is one of those guys who can turn his hand to pretty much anything. He liked the harry concept, saw that intelligent infusion was a no brainer, developed his own software to draw it, taught himself finite element analysis and composite engineering, got a casual job drivingbuses, put his academic pursuits on hold, moved into a shed on a farm and started building. The rest, as they say, is history. A full description of the project is here. 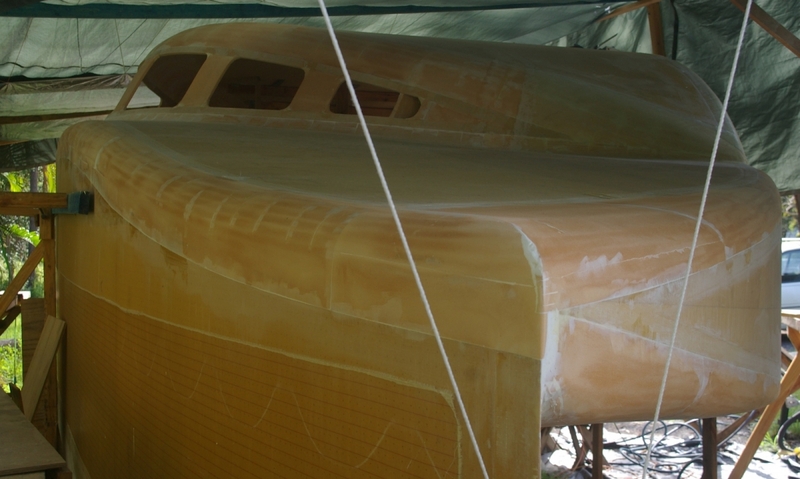 Construction: KSS foam core glass epoxy with principally carbon epoxy crossbeams, foils and wing rig elements. Accommodation: queen size cabin, single cabin and a spacious saloon containing another single. Sufficient space exists in the leeward hull for two singles, however I think there will be serious competition for storage. 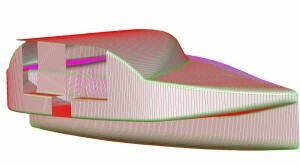 There is additional space in the forward sections of the windward hull for 1800mm long single berths; however one or both will be used for storage, shower and head.